According to a new market report published by Transparency Market Research titled “Global Sheet Face Mask Substrate Market -Global Industry Analysis, Size, Share, Growth, Trends, and Forecast, 2018 – 2026,” the global sheet face mask substrate market is expected to reach US$ 1585.4 Mn by 2026. The market is estimated to expand at a CAGR of 6.8% during the forecast period from 2018 to 2026. In terms of volume, the market is expected to reach 80.9 million kilograms, expanding at a CAGR of over 5.6% by 2026. The sheet face mask substrate market in Asia Pacific is projected to expand at a significant growth rate during the forecast period due to the availability of rich resources of raw materials of sheet face mask substrate in the region. The cosmetics industry in Europe witnessed significant expansion in 2016. The European Free Trade Association has majorly impacted the cosmetics industry in Europe. China, India, and Japan are major markets for sheet face mask substrate in Asia Pacific, in terms of consumption. Demand for bio-cellulose material is increasing owing to improved beauty benefits from the material, which in turn is driving the sheet face mask substrate market. Another driver is the changing lifestyles of consumers coupled with the influence of Western culture, in terms of cosmetics and skin care. Additionally, the increasing trend of utilizing organic products, looking young, or employing anti-aging products has propelled the sheet face mask substrate market globally. The market for sheet face mask substrate in developing countries such as India, Brazil, China, Indonesia, and Argentina has been witnessing steady expansion for the last few years due to the strengthening economic conditions in these countries. This factor has led to the increase in purchasing power of consumers, thereby prompting them to utilize sheet face mask substrate as a skin care product. Furthermore, expansion of economies of developing countries is prompting manufacturers operating in the sheet face mask substrate market to increase their presence in these countries in order to capitalize on expansion opportunities. However, currently, the impact of this driver is medium, and it is expected to be high in the short- and long-term. Sheet face mask substrate have gained popularity among the urban population of almost every country, worldwide. Improved economic conditions in countries of APAC, MEA, and South America have fueled the purchasing power of the people in these countries, which has positively impacted the sheet face mask substrate market. In Asia Pacific, the sheet face mask substrate market is expanding in countries such as China, Japan, India, and Rest of Asia Pacific. China was a prominent market for sheet face mask substrate in Asia Pacific, followed by South Korea, in 2016. Additionally, semi-urban areas present significant opportunities for the sheet face mask substrate market owing to the rise in disposable income and changing lifestyles of people in these areas. 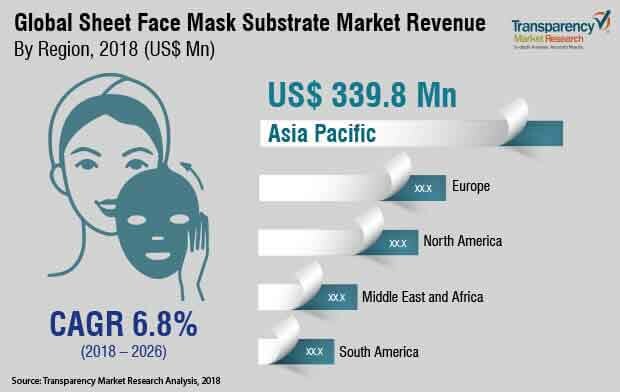 Increasing emphasis of the young generation on their appearance has boosted the sheet face mask substrate market in APAC, MEA, and South America. In terms of substrate type, the global sheet face mask substrate market can be segmented into nonwoven substrate, cotton, hydrogel, and bio cellulose. Bio cellulose substrate is gaining popularity and is expected to expand at a CAGR of 10.1% during the forecast period owing to the usage of natural ingredients in products. Improved beauty benefits offered by bio-cellulose material are fueling the demand for this material. Consequently, an increasing number of manufacturers of sheet face masks are focusing on widening their sheet face mask product portfolio with bio cellulose material. There are two types of bio cellulose material: wet and dry. Wet bio-cellulose material is manufactured without adding preservative treatments. The process of manufacturing this substrate type involves the fermentation of coconut juice. This formulation enables moisturizing, anti-aging, and whitening. Non-woven fabric is expanding at a steady pace due to the quick drying nature and lack of sticking capacity of non-woven fabric. The cotton segment held a prominent share of the market in 2017 due to the soft and breathable property of cotton sheet face mask substrate. Additionally, hydrogel fabric is employed in sheet face mask substrate due to its hydrophilic nature, which helps retention of water in its three-dimensional structure. In terms of geography, the global sheet face mask substrate market can be segmented into North America, Europe, Asia Pacific, Middle East & Africa, and South America. Asia Pacific is expected to witness significant demand for sheet face mask substrate owing to the presence of large number of manufacturing utilities and upcoming technological developments in the region. South Korea and China are major countries fueling the demand for sheet face mask substrate in Asia Pacific. Similarly, in North America, the U.S. is a major market for sheet face mask substrate. Key players included in the report are Alliqua BioMedical, Inc., Bel Mondo Beauty, LLC, Biocrown Biotechnology Co., Ltd., Denex International, Fitesa S.A., Intracosmed AG, KATECHO, INC., Nox Bellow Cosmetics Co., Ltd, Shanghai Gui Zhi International Trading Co., and Ltd., and TAIKI GROUP. The companies operating in the market are focusing on research and development activities along with mergers and acquisitions, and product innovation in order to strengthen their position in the market. Moreover, product development emphasizes on providing personalized experience to consumers.